Stamped Sophisticates: Do you like texture on your greeting cards? Do you like texture on your greeting cards? Here's another card I designed for swaps at Convention...featuring lots of texture. I love the new Apothecary Accent Framelit dies and the butterfly stamps from Papillon Potpourri (w-123757; c-123759)! This card features several easy-to-do textures. The Early Espresso layer uses the new Core-dinations Card Stock from the Holiday Mini. Core-dinations Card Stock is sandable card stock that crates an antique, distressed look when sanded. The inside layer is a monochromatic color. I sanded my cardstock but you can also reveal the inside layer by tearing or distressing. The Certainly Celery layer is dry embossed with the Vintage Wallaper Folder (120175). Both layers only took minutes to create. 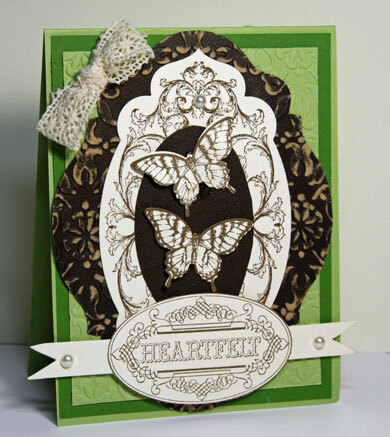 The addition of the punched butterflies and the Crochet Trim added more texture to the card. I used the largest of the Layered Labels stamp from the Holiday Mini. I covered the sentiment in the center with a hand-cut oval and then added punched butterflies using the new Elegant Butterfly Punch (127526). I stamped the center section of the Layered Labels stamp again and hand cut the oval center and placed it on a banner die cut from the Petal Cone Bigz L die. (We need an Oval punch that size...hhmmmm... I think I have something for the Stampin' Up! suggestion box). New dies; new texture folders, new stamps; new tools -- what's not to love! Want to save some money on your fall and winter holiday craft projects? Sign up as a demonstrator in early August to earn a discount on a customizable starter kit ($125 in product for $99). Beginning August 1, if you sign up you'll also receive a Halloween Home decor kit that you'll love! Let me help you select the starter kit items you really want today and we'll hold the order until the August promotion begins! As a Demonstrator you'll also be able to attend Convention next July and hear from Stampin' Up Staff presenters like Pam Morgan, Donna Griffith, Carrie Cudney, and the always humorous and irreverent Bonnie Thurber. They share great tips from research they've done on what makes a successful Stampin' Up! demonstrator to help you start your own successful business or enjoy your stamping as a passionate creative outlet and a reason to get together with friends, family and neighbors. Want to experience what a Stampin' Up! Convention is like? Watch this video below. It was streamed live the last day of this year's convention to demonstrators...but now you can see it too! Note that the demontration also uses the Layered Labels stamp set. You can create so many wonderful looks with this stamp set!